Home Google Ads What is Pay-Per-Click? Have you ever came across the term “PPC” in the digital industry? PPC refers to pay-per-click, an internet marketing model in which advertisers pay or are charged each time their ads are clicked. It is used to drive traffic to a particular website by displaying ads on a search engine for users to click on. Businesses that are running ads are charged when users click on the ads that are advertised, hence the term “pay-per-click”. PPC advertising can appear on search engines, different advertising networks and also various websites across the world wide web. Essentially, there are many types of PPC ads, but search engine advertising and display advertising are the most common types. Both B2B and B2C businesses use PPC to drive new business leads and generate more sales. It is also another method for a business to reach for new prospects. The best option for PPC advertising will depend on the nature of your business and your business goals, i.e. who are you selling to, what are you selling, how do you want to reach your customers. With PPC advertising, you can reach out to the most relevant customers. Most search engines companies provide a platform for advertisers to display ads in their search results page (Google via AdWords, Bing via Bing Ads, etc.). Paid search advertising is a PPC model in which businesses bid on keywords and ads are triggered when users perform a search using a search engine. For example, whenever a user searches for something on a search engine, the Search Engine Results Page (SERP) will show relevant results consisting of organic and paid listings. Search ads that are triggered and shown on the SERP are usually indicated to distinguish them from organic results. Typically, sponsored ads are shown on the top of the SERP, but some are at the bottom of the SERP. On Google, these ads are indicated with a small green box with an “Ad” label beside the URL. When do these ads appear and how is it triggered? 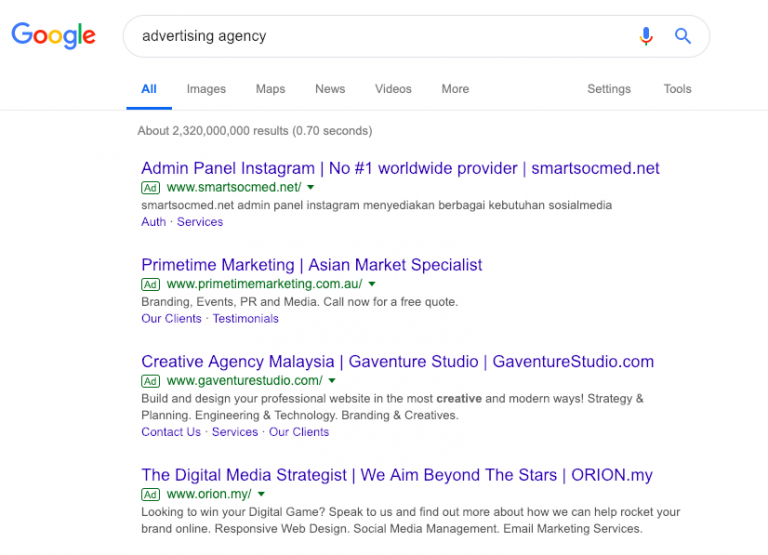 Ads do not simply just appear on the SERP when a user searches for the keywords that businesses are buying into, but instead depend on an Ad Auction system that is automated by most major search engines. 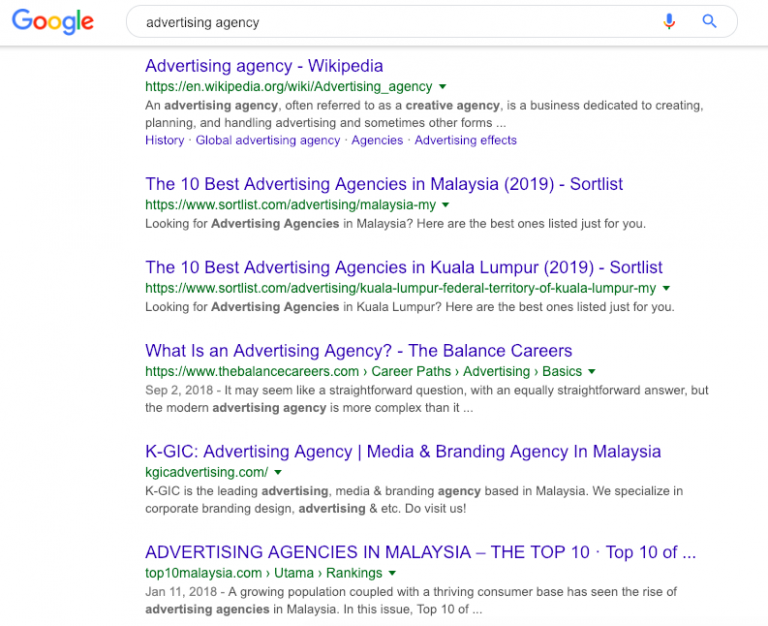 Additionally, advertisers cannot just pay an amount for their ads to be more prominent or noticeable than their competitors’ ads but will need to enter the Ad Auction to determine the relevancy and validity of the ads for them to appear on the SERP. Every time a search is initiated, the auction begins, and the search engine will rank the ads that will appear on the SERP. The ranking determines the cost that advertisers have to pay. As mentioned above, it is not solely based on the amount that advertisers or business are willing to pay but other factors as well. Google has an Ad Rank system that determines which ads appear on the page. This Ad Rank is calculated based on the CPC (cost per click) bids advertisers are willing to pay and the Quality Score which comprises of several elements – Expected click-through rate, Landing Page Experience and Ad Relevancy. This ensures that users find ads that are relevant to them and advertisers are able to reach the correct potential customers. To find out more about digital marketing and how it can improve your business, read more or sign up for our SearchGuru Academy training sessions. As a Senior Performance Specialist at SearchGuru, Nicole has a great interest in planning digital campaigns. She’s also a yoga enthusiast. What is Organic Traffic and SEO? SearchGuru © 2005 - 2019. All rights reserved.